These children and animals are all very different to each other. Some are big, some are small. Everyone is playful, but who's the best at hiding? But one thing's certain: they all love a good bedtime story! The perfect picture book for little ones who are just beginning to make s... read full description below. These children and animals are all very different to each other. Some are big, some are small. Some are gentle, some are rough. Everyone is playful, but who's the best at hiding? But one thing's certain: they all love a good bedtime story! The perfect picture book for little ones who are just beginning to make sense of their place in the world. 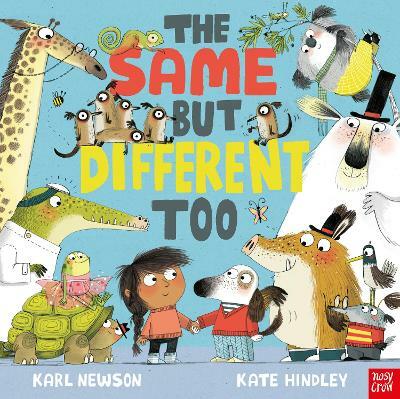 Karl Newson (Author) Karl Newson is a children's book author and illustrator from London. He takes inspiration from songs and books and people and everything! His favourite things are elephants, stars and his two mini Mudwafflers. His least favourite thing is mashed potato - bleurgh! In his spare time he enjoys walking and listening to music from the 1960s (and singing along - badly - to them), and biscuits. Kate Hindley (Illustrator) Kate is a children's book illustrator living and working in Bristol, UK. She worked as a Print Designer at a Northamptonshire-based design company before she got her first book deal with Simon and Schuster back in 2011, illustrating Claire Freedman's The Great Snortle Run, which was nominated for the Kate Greenaway award. Since then, Kate has illustrated a number of bestselling picture books, including The Naughtiest Girl, The Wishing Chair and You Must Bring a Hat.